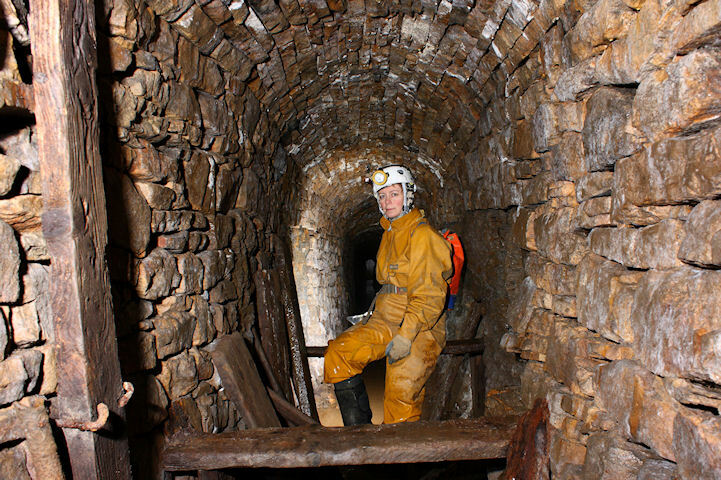 The mines of Nenthead and the surrounding area are well known to many a mine explorer. Some of the most extensive systems in the UK, the now naturalising mines are a feast for the cave photographer - and presented here is a small selection of photographs taken during a series of visits in 2009 to Smallcleugh, Rampgill and Middlecleugh (which is gated and requires special permission for access). Sadly, some areas of the mines have been seriously damaged - in part by those who do not have an appreciation for the archeaology, but also by mineral collectors, selfishly hacking at the few remaining deposits for either their own collections, of for commercial gain. If you choose to visit these interesting mines - please treat them with respect. Take nothing but photographs, and leave nothing - not even foot prints! Arched passage in entrance to Hodgson's low level. A key feature of the Nenthead lead mines is the way the passages have been driven. These are mostly through shales, or on the shale-limestone boundary, and arched over for stability. The work of the dry-stone wallers is truly impressive, and very extensive.